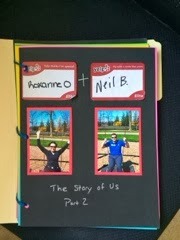 I think Neil started proposal planning shortly after our first date. While I am a commitment-phobe, he is alll about commitment. Not saying that's a bad thing, but that's one of the few things we don't have in common. I would have been perfectly content living in my little house with a bunch of cats for the rest of my life, but I guess that's not what the universe has in store for me. His plan picked up steam in November when he asked my mother for my hand in marriage. My mom tells me absolutely everything, and I'm surprised she didn't spill the beans. He told her he planned on proposing in February, but...somehow that plan got pushed up a little. Earlier this year, I planned a surprise getaway for Neil's birthday. To throw him off track, I told him to pack all sorts of ridiculous things to bring with him - everything from sharp kitchen knives to a wine opener. We ended up spending the night at Gervasi Vineyard and had an amazing time. So when my fiance told me that we were going to go on a random one day trip for our 10 month anniversary in December, I thought nothing of it. He'd actually mentioned wanting to go back to Gervasi for the holidays, so I thought that was where we were going. But I was dead wrong! We set off on our trip and headed down 71. Once we got past Canton, I realized we weren't going to Gervasi. It hit me that we were headed to Columbus. Kind of random, I thought, but we'd gone there for one of our first dates to go see Maroon 5 and I thought he just wanted to make a quick inexpensive trip to get away from the hustle and bustle of the holidays. Wrong! We got to Columbus and checked into the Hyatt hotel. (I travel a lot for work and absolutely love Hyatt hotels and their points program) It was kind of a grey, rainy day. We'd left around lunchtime, and by the time we arrived, I was starving, so we went to one of my favorite Columbus restaurants - Betty's. Neil mentioned that he was wearing the same outfit he'd worn the last time we were in Columbus, and I realized that I'd accidentally worn the same outfit, too. And yet that didn't set off any alarm bells in my head. We continued to relive the events of our original date night in Columbus. And that included a lot of drinking. We even stopped at the new Melt in Columbus...where we had some late night tofu wings and more drinks. Too many drinks, actually. Ugh. We got back to the hotel and Neil told me that he had a surprise for me. He pulled out the nicest scrapbook I've ever seen. He'd saved literally everything from every single date we'd gone on and every single everything from any place we'd gone to. There were pages and pages of pictures, and receipts, and fun memories. And then we got to the last page. Or 2nd to last page, actually. There was a picture of us from the World Series of Wine and underneath it was a picture of two old people. 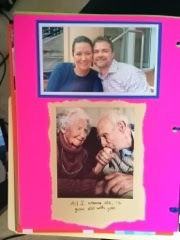 Under the picture of the older couple, Neil had written, "all I want to do is grow old with you." Neil said he had another surprise. And all I could say was, "no," repeatedly. Because I'd had too many drinks that evening, what actually transpired is a little hazy in my memory. But I can tell you that I said no to Neil's proposal. Judge me, hate me, think what you will, but in my heart, it didn't feel right. I was drunk, unhappy with certain aspects of our relationship, and I just felt like it wasn't the right time. We talked endlessly about being engaged throughout the night. And into the next morning, in between me getting sick from being super hung over. I knew I loved Neil, but I felt like we needed some time to talk through some things, figure some things out, and make a solid plan for the future. I agreed after much debate that we should stay engaged but work on our relationship. Because I felt like that was the right thing to do and because Neil had already told all of our friends about his intentions, and they were going to be at my house for party the next night to congratulate us. But we did end up returning the ring he bought for me. It was very lovely, and he'd bought something I thought I would like, but on my finger, it just didn't work. Then we bought a replacement ring and it couldn't be sized without damaging the integrity of the ring, so at that point I got frustrated and fed up and decided that we needed to wait before we moved further with any more wedding related details. At this point, you might think this story doesn't have a happy ending. But it does. This whole catastrophic series of events has brought us even closer and has made me 100% sure that Neil is the right person for me. Because I really doubt anyone else would have taken my indecision and pickiness over jewelry so well. He gets me. And likes me for me. And besides being a little impatient about this whole commitment thing, we're generally on the same page about everything. It's been about 2 months since Neil proposed and I can say that we are in a much better place than we've ever been. We've found a ring that I like and that is going to be custom made. (considering how the first proposal went we're thinking of re-doing it so I can have a nicer, clearer memory of it) I've found a caterer that has multiple vegan options. We've started saving up for a wedding. We're planning our engagement photos and have selected an engagement photographer. Everything is really falling into place. And I'm very excited to see what the future has in store for us.